There was another burst of song, and then suddenly, hopping and dancing along the path, there appeared above the reeds an old battered hat with a tall crown and a long blue feather stuck in the band. With another hop and a bound there came into view a man, or so it seemed. At any rate he was too large for a hobbit, if not quite tall enough for one of the Big People, though he made noise enough for one, stumping along with great yellow boots on his thick legs, and charging through grass and rushes like a cow going down to drink. He had a blue coat and a long brown beard; his eyes were blue and bright, and his face was red as a ripe apple, but creased in a hundred wrinkles of laughter. Tom comes along as a deus ex machina for the hobbits, very fortunately for them and for the narrative as a whole, but in such a way that is jarringly out of step with the tone and style of the rest of the novel. Even in these early chapters where Tolkien has not quite shaken off the vestiges of The Hobbit, Tom’s appearance is baffling (and I would also argue he would have even been a bit much for The Hobbit). He rescues them from Old Man Willow and gives them respite in his cottage for a couple of days while he tells them stories and his wife Goldberry the River-Daughter serves them meals. [T]his does not seem to me a good description of what happens. What really happens is that the story-maker proves a successful “sub-creator.” He makes a Secondary World which your mind can enter. Inside it, what he relates is “true”: it accords with the laws of that world. You therefore believe it, while you are, as it were, inside. The moment disbelief arises, the spell is broken; the magic, or rather art, has failed. You are then out in the Primary World again, looking at the little abortive Secondary World from outside. If you are obliged, by kindliness or circumstances, to stay, then disbelief must be suspended (or shifted), otherwise listening and looking would become intolerable. But this suspension of disbelief is a substitute for the genuine thing, a subterfuge we use when condescending to games or make-believe, or when trying (more or less willingly) to find what virtue we can in the work of art that has for us failed. In other words, Tolkien’s gripe with Coleridge is the qualifier “willing”; a well-wrought story that does not transgress its own internal coherence does not require the reader to be “willing,” as the acceptance of that Secondary World is intuitive. Awareness of disbelief, he argues, is fundamentally at odds with belief. “Hooo. 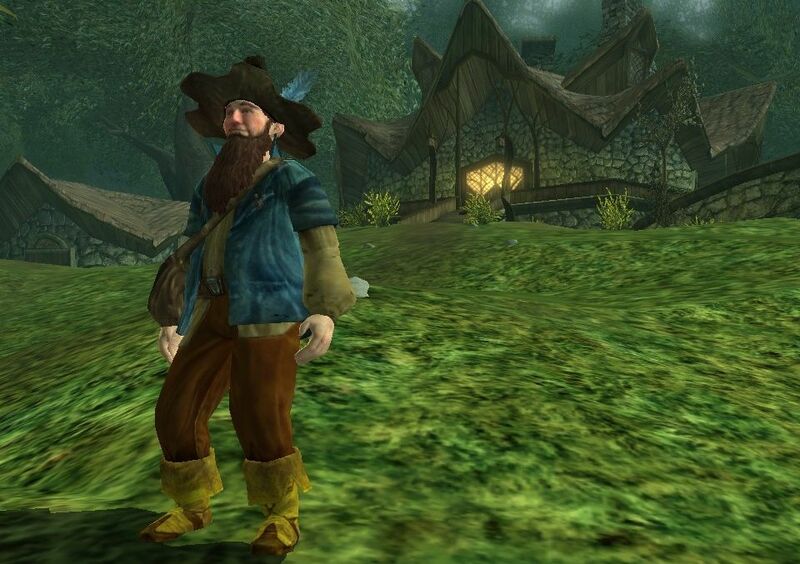 Tom Bombadil. Look what night has brought you! But again through his super-power of speaking sternly, he puts the Barrow-wight to flight, and then the next day goes and repays Goldberry for her mischief by abducting her and compelling her to marry him. The end. If nothing else, this earlier version of Tom is intriguing because we see the raw material of the three chapters that have so irked a lot of Tolkien readers: the Willow trapping an unwary person, the Barrow-wight, and of course Tom himself and his love of Golberry (though his interactions with her in the novel are less kidnappy). All is presented here in lighthearted fashion: both Old Man Willow and the Barrow-wight (especially the Barrow-wight) are far more sinister in The Lord of the Rings—in this poem, they’re comic villains easily dispatched by Bombadil. They are just as (apparently) easy for him to dispatch in The Lord of the Rings, but because their prey is unwary mortals, we have a more profound sense of just how dangerous they are. So who is Tom Bombadil? How does he fit into the larger mythos of Middle-Earth? Is he, as some assume, merely an anomaly? It is tempting to see him as something Tolkien threw in while he was still finding his way with this—one of the most-quoted passages from Tolkien’s letters is where he describes the process of writing LotR as an adventure in itself, that he was as surprised by his heroes’ encounters as they were. The first eight chapters carry much of the spirit of The Hobbit—but did Tolkien write Tom Bombadil, cannibalizing his earlier poems, when he still had the sense his new book would be much like the last? And then, having written him, was he reluctant to edit Bombadil out? I had forgotten Bombadil, if indeed this is still the same that walked the woods and hills long ago, and even then was older than the old. That was not then his name Irwain Ben-adar we called him, oldest and fatherless. But many another name he has since been given by other folk: Forn by the Dwarves, Orald by Northern Men, and other names beside. Given that he seems to precede the elves and the strife and conflicts of Middle-Earth, he is a being out of time. As Gandalf says, “the Ring has no power over him. He is his own master. But he cannot alter the Ring itself, nor break its power over others. And now he has withdrawn into a little land, within bounds that he has set … and he will not step beyond them.” If my speculation is correct and Tolkien wrote the Bombadil sequences before he had a grasp of where LotR was going, he at least did a yeoman’s job of building him into the mythology. (Which, of course, he also did with The Hobbit: both in terms of incorporating its “sequel” into the broader mythology he had been constructing for over twenty years, but also by offering supplementary material in the appendices of The Lord of the Rings and Unfinished Tales in which he made clear the fact that Bilbo’s adventure to the Lonely Mountain was a sideshow—orchestrated by Gandalf—to the broader conflict between the White Council and a re-emergent Sauron. If nothing else, the stubborn inclusion of Tom Bombadil is another example of Tolkien grafting his stories for his children onto his broader mythology). If I were to make a more specific defense for poor Tom, however, it would be this: perhaps it has taken me multiple rereadings of this novel and that touch of world-weariness we all adopt as we age, but I now see in Tom Bombadil something of a poignant pathos. Who is he, after all? All we know is that he is ancient and immortal, and hugely powerful, but essentially indifferent to the travails of the world. The question I now find myself asking is why he chooses to be this person? Why, when you possess that sort of power, do you choose to dress so ludicrously (sort of like an inept wizard imitating a muggle, when you get down to it), limit your domain to a relatively tiny acreage of forest and down, and devote your days to capering through meadows singing nonsense verse? Leaving aside for the moment the fact that there’s probably a good number of us who wouldn’t mind that kind of life (at least in retirement, if not necessarily in eternity), there is in that choice, I feel, a powerful undercurrent of melancholy: a deliberate withdrawal from the world “into a little land, within bounds that he has set,” as Gandalf says. As if, having seen too much of the world’s cruelty and pain, he wants nothing to do with it … which, incidentally, resonates with that crucial little moment when he puts on the Ring and nothing happens. Suddenly Tom’s talk left the woods and went leaping up the young stream, over bubbling waterfalls, over pebbles and worn rocks, and among small flowers in close grass and wet crannies, wandering at last up to the Downs. They heard of the Great Barrows, and the green mounds, and the stone-rings upon the hills and in the hollows among the hills. There were fortresses on the heights. Kings of little kingdoms fought together, and the young Sun shone like fire on the red metal of their new and greedy swords. There was victory and defeat; and towers fell, fortresses were burned, and flames went up into the sky. Gold was piled on the biers of dead kings and queens; and mounds covered them, and the stone doors were shut; and the grass grew over all. Sheep walked for a while biting the grass, but soon the hills were empty again. A shadow came out of dark places far away, and the bones were stirred in the mounds. Barrow-wights walked in the hollow places with a clink of rings on cold fingers, and gold chains in the wind. No wonder he’d rather spend his days roaming meadows and gathering water-lilies for his wife. But to end on a cheerful note: many have speculated on what a confrontation between Tom Bombadil and Sauron might have looked like. Thanks to the internet, we now know.